Micah Shilanski is a CERTIFIED FINANCIAL PLANNER™ professional who specializes in helping federal employees get the most out of their federal retirement benefits. What is Different about Micah? Micah has unique experience in federal retirement benefits. Micah teaches FERS pre-retirement classes. But he more importantly – as a financial planner for federal employees – he has helped individual federal employees through the entire retirement process. This is unique. Because very few federal retirement experts have actual experience helping individual federal employees step by step through the entire retirement process. This combination of teaching experience – and real life experience – provides Micah with unique insight he uses to help federal employees understand their benefits from a financial planning perspective. What is Different about Micah’s Approach to Financial Planning? Micah has a different approach to planning than most financial advisors. While many financial professionals talk about financial planning – they’re often only really focused on your investments. Micah is different because he looks at your entire financial picture, not just one piece of the pie. Micah looks at all the pieces of your financial puzzle and helps you put them together in a way that achieves your goals. And Micah has long-term relationships with his clients. Micah’s clients usually hire him several years before retirement. They work together through all of the nitty-gritty details of retirement and continue working together for years beyond retirement. You can’t form that type of relationship with your clients unless they like and trust you. What is Different about Micah’s Approach to Federal Benefits? Micah’s experience is different from other federal retirement experts, because he has experience helping individual clients as a financial planner for federal employees. Your federal retirement benefits are an important part of your financial picture. Micah can help you make the most of your federal benefits while making sure all the other pieces of your financial plan are working together. As a federal employee – you have one of the best benefits packages available. As you know, it’s also one of the most complex benefits systems out there. There are so many unique provisions and exceptions. It’s important to make sure you’re making the best decisions for your personal situation. Micah approaches federal benefits from a financial planning perspective. It’s one thing to understand your benefits – but the next step is to understand how they fit into your overall financial picture. Micah’s experience as financial planner for federal employees provides him with valuable insight into the unique planning needs of federal employees. How Does Micah Help People? Micah helps his clients with tax planning, retirement planning, federal retirement planning, estate planning, and investment advice. Click here to find out more about scheduling a personal consultation with Micah. Micah has been teaching pre-retirement classes in Anchorage, Alaska, since 2006. Many of the people who attend his classes say they learned new things they never heard of in other pre-retirement classes. Click here to see information about upcoming FERS Pre-Retirement classes in Anchorage, Alaska. Micah has helped a handful of financial planners learn about federal benefits – and how to help federal employees retire successfully. Micah is considered a top expert on the unique benefit for CSRS called the CSRS Voluntary Contributions Program. “The Best Kept Secret in CSRS” ebook Micah wrote is the most comprehensive reference available on the topic. Click here to learn more about The Best Kept Secret in CSRS. Micah created the website Plan-Your-Federal-Retirement.com to help federal employees learn about their benefits from a financial planning perspective. 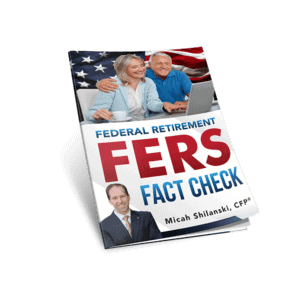 Each month, Micah shares an original article on federal retirement topics through FERS Federal Retirement Fact Check the Official Monthly Newsletter of Plan-Your-Federal-Retirement.com. Micah writes popular articles on federal retirement topics for the website, FedSmith.com. Click here to see a list of Micah’s articles at FedSmith.com. Micah has been interviewed for several articles in NARFE (National Active and Retired Federal Employees Association). He has also been mentioned in several articles by Tammy Flanagan at GovExec.com. Last year Micah debuted a new exclusive online workshop called, “3 Critical Concepts… That Most Federal Employees Miss When Planning Their Retirement.” It’s only offered a few times a year. Click here to find out more about 3 Critical Concepts. Micah is a lifelong Alaskan. Integrity and discipline are important aspects of Micah’s life. Micah is an Eagle Scout, a private pilot with his own bush plane, an accomplished martial artist and a Rotarian. Interested in Working with Micah? If you’re looking for a financial planner who can help you with all the pieces of your financial puzzle – including your federal benefits – the first step is to schedule a personal consultation with Micah Shilanski, CFP®.